This week sees The Frame Loop swarmed with discussion of JUNGLE themed cultural texts.With their array of verdant tones, distinct textures and sharp contrast between potential tranquility and the violent side of nature, it’s no surprise these environments are the muse of many a great artist; below are our five choice selections of artworks depicting such scenes. Lin Onus is an Australian painter acclaimed for his blend of traditional Aboriginal imagery and photorealist landscape compositions. This approach, as well as the artist’s singular use of contrasting textures, is evidenced well by Jimmy’s Billabong, in which a striped pattern similar to a ‘rarrk’, an Aboriginal cross-hatch painting technique, obscures a peaceful billabong scene displayed on canvas. 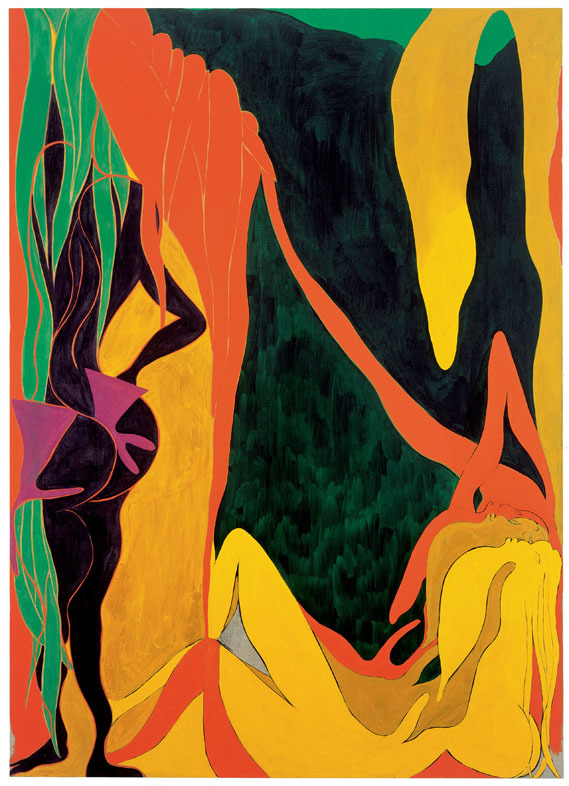 Chris Ofili is a British painter who has been a member of the Young British Artist movement, received the Turner Prize in 2008, and courted controversy by utilising elephant dung in an number of his works. The Raising of Lazarus was completed once he’d moved to Trinidad, and harnesses the island’s cultural aesthetic to reinterpret the biblical scene that the title appropriates. Abstracted female forms frame a landscape suggested through verdant swathes of green, providing an effective contrast in tone and texture. Henry Rosseau was a French artist whose oil paintings are among the most famous artistic depictions of jungle scenes. 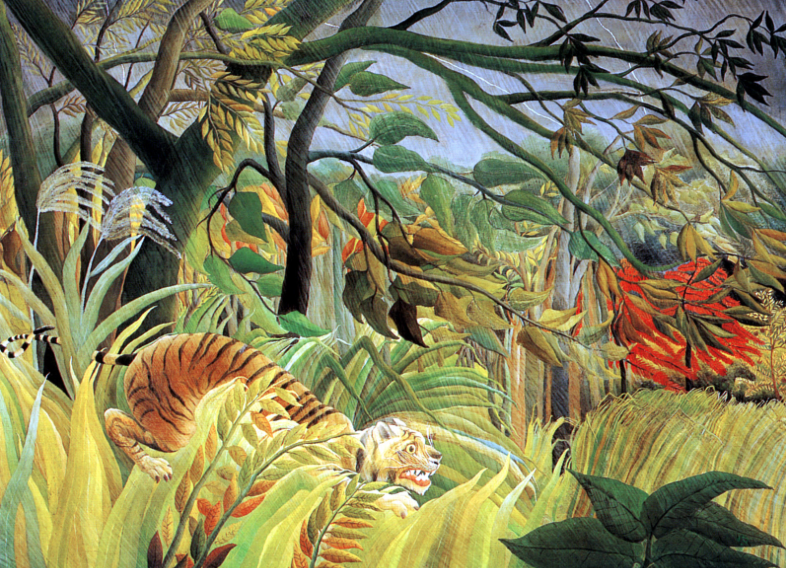 Tiger in a Tropical Storm was the first in a long line of such ompositions which the artist created through reference of zoological prints, taxidermy and by utilising a vivid imagination; for, Rosseau never once left France. Perhaps owing to this detachment, his paintings have a lucid nature quite unlike the work of any other artist. Peter Doig is a Scottish artist best known for his large-scale landscapes. 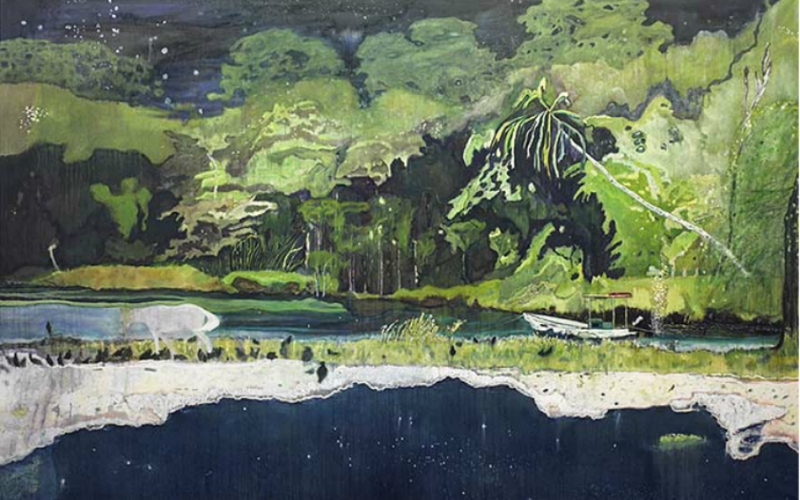 Doig spent a portion of his childhood in Trinidad, and has been based on the island since 2002 (he works closely with Chris Ofili; the pair have been known to collaborate on paintings). Grande Riviere is a fine example of what Doig calls ‘abstractions of memories’. He often uses old photos or postcards as starting points for paintings, and finds that any paint splatters on reference sources aid his process; Doig notes that they add ‘an unexpected layer you can then refer to … [they take] the reality away from the photograph and turns it into a more abstract image’. 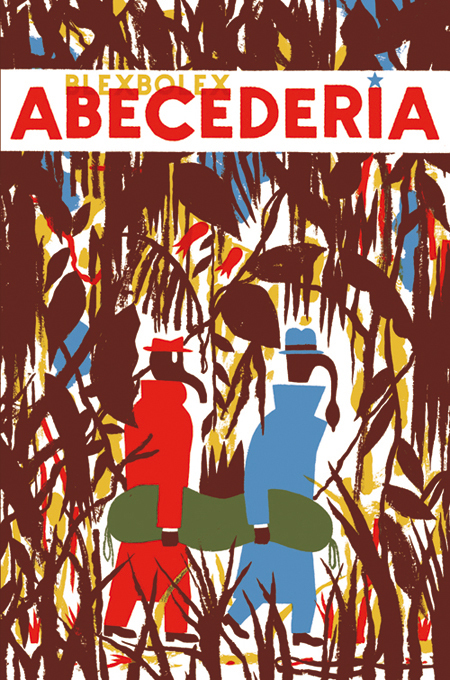 Abcederia is a graphic novel by French illustrator Blexbolex. The book is structured around the alphabet, with each letter providing the starting point of an episode in a broader Noir-inspired narrative in which two French gangsters, Bernard and Leon Blanchett, head to into the jungle in the hopes of evading the police following a botched bank robbery. This stunningly designed volume displays illustrations brimming with imagination and a striking use of colour. It’s available from London-based publishers Nobrow. What have we missed out? Let us know about your favourite jungled-themed art, and add to discussion with a comment below. This entry was posted in Art and tagged abcederia, art, blexbolex, chris ofili, grande riviere, henry rosseau, jungle, lin onus, nobrow, peter doig, rob fred parker, the frame loop. Bookmark the permalink.